I regret that I have not been able to post the new designs on the official website, www.yoreclothes.com yet. My website has been through three stages so far- the first two were red, so all of my business cards and tags are still red. I changed to my new site (the one you see now) in February of this year, and I am still waiting for the new purple tags to come in before I post new inventory. I am very excited about the new designs! Also, If you grew up during the late 60's or mid 70's, what did you wear? I have been doing alot of research on the 70's, and I confess that I can't find very much. My 1970's section on the website needs alot of new designs! 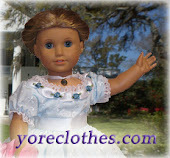 If you have a picture of an outfit that you would like to see in a doll form, send it to yoreclothes@ntelos.net . The 'Young Victoria' Dress- a blue satin Civil War ball gown in a new design based on the major motion picture about Queen Victoria. The 'Dorothy' Dress - A cute ensemble that is based on the costume worn by the character 'Dorothy' in the film 'The Wizard of Oz'. The 'Judy' Dress - A bright dress that captures the essence of the Summer season! All of these new designs are coming soon to the Doll Clothes of Yore website, www.yoreclothes.com ! I made this outfit in October of 2010, and I thought some might find it interesting. I did some historical reenacting and realized that I didn't have a dress in the correct time period, so I made this in a hurry! The design is based on a period illustration and has classic leg-of-mutton sleeves. I thought you all would enjoy seeing pictures. This new dress was inspired by a dress seen in the 2008 'Masterpiece Theater' film, 'Emma'. It is made with antique taffeta that is a bright fuschia color. It is called the 'Josephine Bonaparte' dress after Napoleon's wife and the first Empress of France. Quanitities of this dress are limited because of the amount of material available. You can find a full description of this dress Here.